Azerbaijani Foreign Minister Elmar Mammadyarov met with his Chilean counterpart Roberto Ampuero as part of his official visit to Chile, the Azerbaijani Foreign Ministry told AzVision.az. 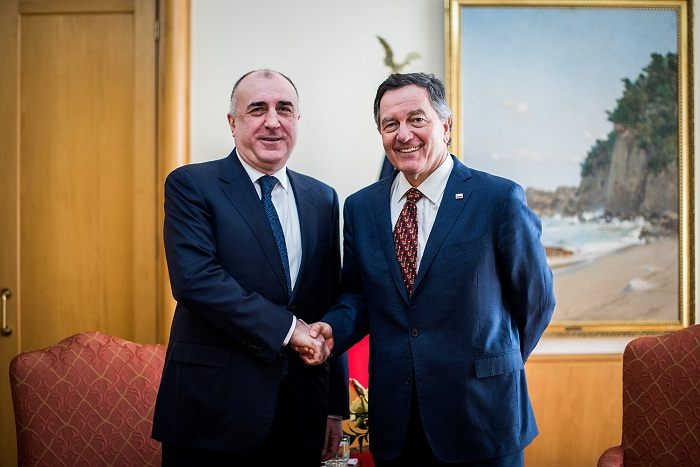 Roberto Ampuero highly appreciated the first official visit of his Azerbaijani counterpart to Chile and expressed his confidence that this visit will further contribute to strengthening the exiting friendship relations between the two countries, adding that Chile is interested in comprehensive cooperation with Azerbaijan. Minister Mammadyarov underlined the importance of intensifying high-level mutual visits between the two countries for the expansion of contacts at various levels and holding political dialogue on regular basis. The sides also exchanged their views on the current issues of international agenda, as well as the situations in the relevant regions. In this context, Minister Mammadyarov informed his counterpart about the latest situation of the negotiation process on Armenia-Azerbaijan Nagorno-Karabakh conflict. Also, the sides discussed the cooperation issues within international organizations, including the Non-Aligned Movement and other issues of mutual interest. Minister Mammadyarov emphasized that Chile is invited to the summit of the Non-Aligned Movement, which will be held on October in Azerbaijan and expressed his hope that that Chile will be represented at the event at the highest level.